That time that I go into overdrive and try to blog for 12 Days straight: 12 Days of Christmas decorations. I was planning on writing a nice announcement post. And than I just totally ran out of time, frantically working to get my projects and posts done in time. So welcome to 12 Days of Christmas Decorations 2014! Joining me again are these uberawesome bloggers, that make me feel all humble and small. It is such an honor to be in the company of these blogging giants. So stay tuned for buck loads of awesomeness coming your way, and remember to check in everyday, because there will be no breaks! You can join us on Saturday 13 December when we each will host a linky party on our blogs. I will be in charge of mantels and pretty vignettes. But onto the project of the day. A day late, but I just couldn’t not start with a little Advent decoration. So here is this years version of my Advent candles decoration. This one turned out very cute, if I say so myself. Didn’t start out this way though. I had this beautiful idea and vision in my head. I started doing it, taking a thousand How-To-Pictures in the process, fully counting on giving you an awesome tutorial. And it was turning out so cool, and exactly as I planned. And than the final step was curing the project in the oven, so I did! And than I went on to do other stuff, and I forgot about the oven…. And I burned my project…..
Not the prettiest bottle, but good base material. So plan B was: cheat a little and prettify a ready bought bottle. As you can see I painted the cork on the original bottle. added washi tape to the cup and replaced the twine and made tags to replace the pine cones. For the tags I added a line of glitter glue to some extra small packaging tags, and punched a circle out of white cardboard. I used some old scratch numbers and simply drew the black outline with a sharpie (from a distance they look just like enamel tags). And than all I had to do was prettify the vignette. If you want to make something similar, I suggest using wide mouth bottles and look for tea light holders / tea light picks in the floral arranging department. 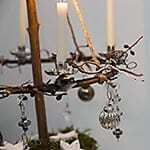 Those are little tea light holders with a pick underneath, usually used in wreaths. You could bend a little hook on that pick and dangle your little ornament/tag/number from it. (sorry searched high and low but did not find a source for them online). That little tea light has been burning all day yesterday (well I had to replace it from time to time of course), celebrating the first Advent. The season has officially started. And I am getting ready for it! And now I must run! I have 11 more projects to finish! This is my fourth year that I have done a little Advent candles decoration. I guess that is a tradition in and of itself. So I will see you tomorrow, and don’t forget to go visit my friends and see how they have kicked off this series! I promise you they have done good! Ohhhhhhhhhhh, Marianne … I just love what you have created. Just found you (through Donna) and I will definitely return. Merry Christmas!!!!! Well welcome! I am glad you found me and I’d love to see you back here. Happy Holiday season! So pretty! I adore the bottle bases as candle sticks! Love how you filled them up! Morning Marianne, So happy you bring your traditions here on your blog. I love your new Advent candle idea. Blessings and smiles, Emilou P.S. We are currently getting snowfall and it sure is ‘beginning to look a lot like Christmas’. Thanks for always faithfully coming by and leaving me comments. It is good to know people actually read my blog from time to time. This is my first time to your blog and I’m loving your ideas. This one especially. This advent candle decoration is an awesome idea and a creative alternate to the traditional advent wreath. I also love the numbers inside the jars as I’m always wondering OK which candle do I light next? LOL! Welcome to my blog. I hope you will be back. And I am so happy that you like my project. Very pretty Advent decoration – I shared it on my Love My DIY Home facebook page. I think it is quite fancy and detailed, but replicable. Those are the best projects! Hallo Marianne. Heel mooi die Advent Candles en wat zul je gejammerd hebben toen je andere project mislukte. Veel sterkte de komende dagen. Je zult het stikdruk hebben met dat full time werken erbij. Groetjes van down under. En ps, hardstikke leuk dat je de kerststerren van onze andere zus op je blog hebt gezet. Wie had dat ooit gedacht! Very, very pretty! Can I ask where you found the bottles? I think they are so cute! Thank you for a great idea. Hi, I found the bottles in a Dutch discount store. But I am sure if you look for wide mouth bottles in craft stores you can find similar ones. Love this post – it’s so fresh and super nice for Christmas! You have brilliant photos!